Minister for Housing and Urban Development, Damien English, T.D. 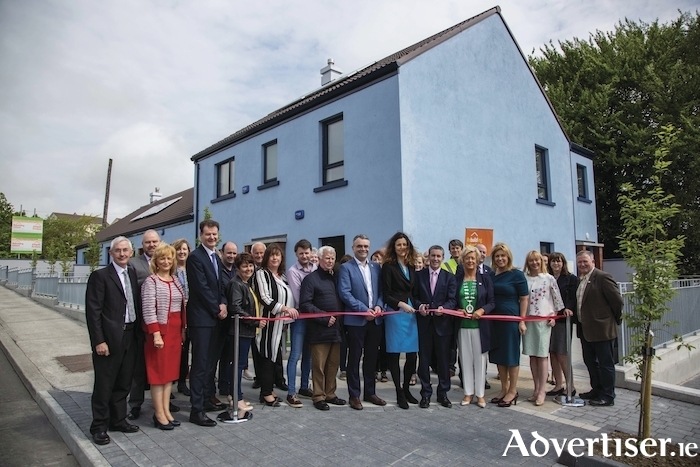 officially opened a new Housing Development at Marian Crescent, Killala Road, Ballina last week. Last Friday, Minister Damien English, T.D. officially opened a new Housing Development at Marian Crescent, Killala Road, Ballina. The development marks the beginning of Mayo County Council’s stream of new build social/affordable housing units coming to fruition between 2018 - 2021. The project commenced last May and was completed just over a year later. The housing development includes the construction of four new accessible dwellings in a single terrace; two single-storey houses and two apartments, with level access showers and protected private gardens to the front and rear. Paul Benson, head of housing for Mayo County Council: "I am delighted to see this new build construction project reach completion. "It is one of the many new build projects which Mayo County Council has on site as it plans for the delivery of 500 new builds social/affordable housing units in Mayo in the period to 2021. I would like to thank the specialist consultants team as well as the Contractor LPB on the delivery of this new Development." Mayo County Council’s Housing Department has many other developments in the offing, including the just-announced stage three (pre-tender ) 18-house development at Abbeyquarter, Ballyhaunis, on completion of the tender process the site should commence in Autumn 2018.